Porg Cosplayers Take Over Star Wars « Adafruit Industries – Makers, hackers, artists, designers and engineers! A porg posse rolled into C2E2 over the weekend. 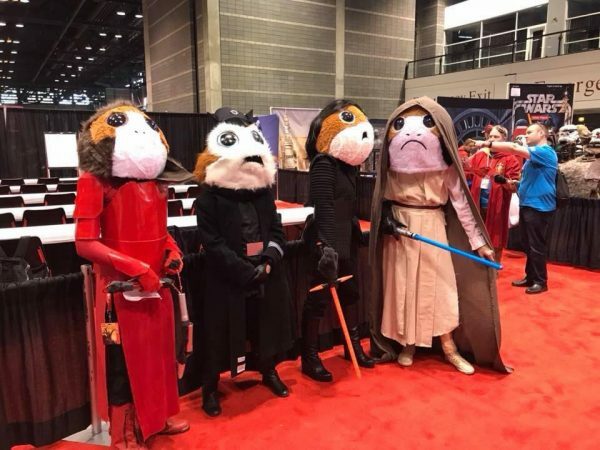 A group of cosplayers mashed together fur-covered porg heads with characters from Star Wars: The Last Jedi: Luke Skywalker, Kylo Ren (that’s hardtshaped), General Hux, and Praetorian guard. It’s the first example of detailed porg costumes I’ve seen, and the first time I’ve seen porgs combined with costumes. I’m sure porgs will become more prevalent as convention season goes on.